Early European explorers in North America had to be shown the healthy properties of the spruce tree by the existing inhabitants. 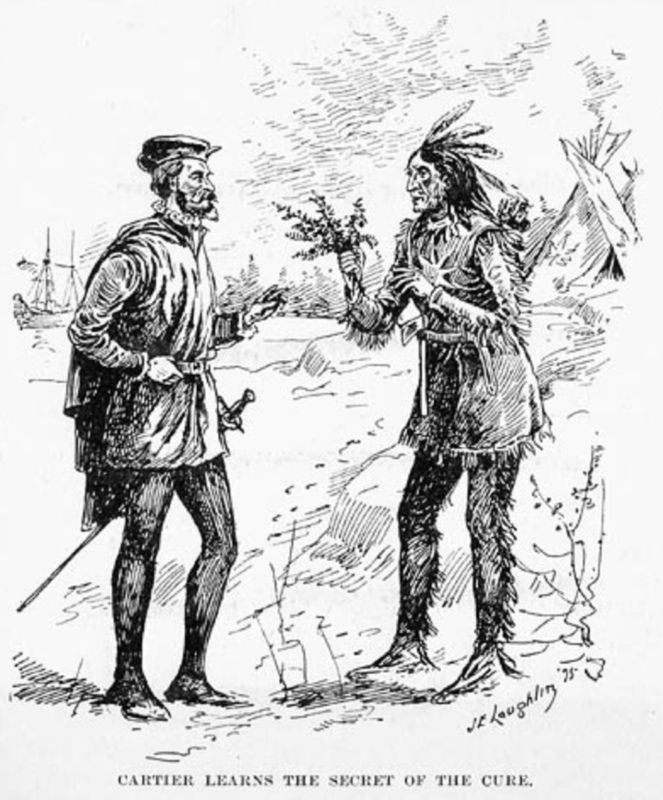 When the Breton explorer Jacques Cartier overwintered in Quebec in 1535-36 on his second visit to the land he had named Canada, almost all his men fell ill with scurvy through lack of fresh food, leaving just ten out of 110 well enough to look after the rest. Huron Indian women showed them how to make tea and poultices from the bark of a local tree, which quickly returned them to health. That tree was probably White Cedar, Thuja occidentalis, a member of the cypress family, rather than spruce. But later French settlers turned to spruce trees, a better source of Vitamin C, and thus a better way to combat scurvy, the curse of long-distance voyagers, than cedars. The secretary to the new French governor of Cape Breton Island, Thomas Pichon, writing in 1752, noted that the inhabitants of Port-Toulouse (now St Peter’s) “were the first that brewed an excellent sort of antiscorbutic [“la bière très bonne” in the original French], of the tops of the spruce-fir”, “Perusse” or “Pruche” in Pichon’s French.